I was going for a masculine feel with this birthday card. 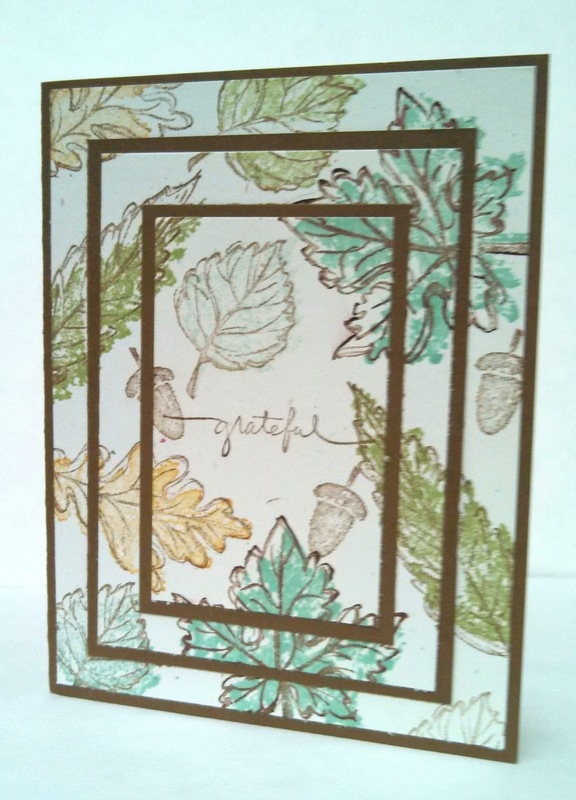 One of my club members is having a card class in October and wanted a few masculine cards. 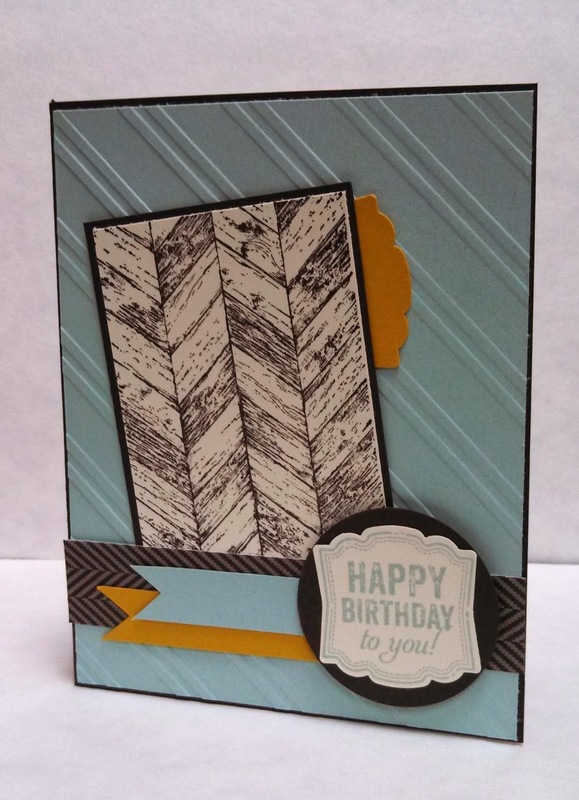 She also likes this woodgrain stamp from Truly Grateful so started with that and used some colors from the Sweater Weather DSP. 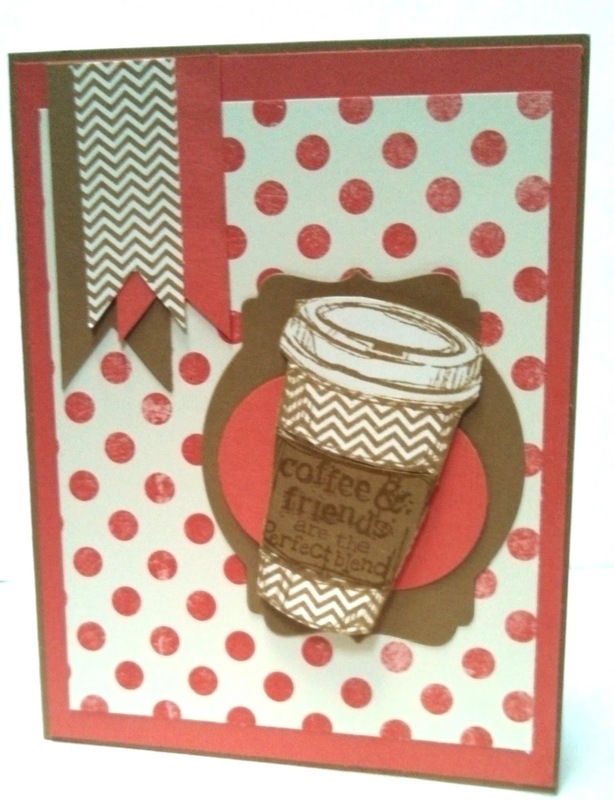 I made this card for a name game entry with my stampin' Pals. We needed to design a card that uses a SU! product that starts with the same letter as our first name. 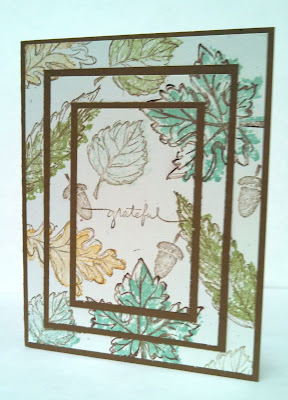 I knew right away I would use Wisteria Wonder ink and Window framelits dies. However, I went to my color coach for a color combo idea and did not expect to match up Wisteria Wonder with Sahara Sand and Soft Sky. 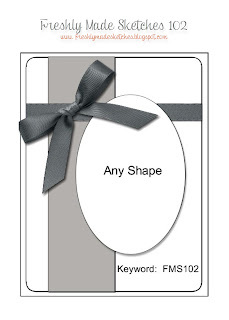 I do like the softness of the card. I will have to remember this color combo for spring! Have a Wisteria Wonderful Sunday! I received this thank you card from my friend Jen. I love this butterfly background stamp and so glad it is still part of our current catalog. I believe she sponged color on and then spritzed it with water before stamping. Much more beautiful in person. Love the matching envelope liner, too! I made this card for a friend's birthday this weekend. Good timing for the sketch. 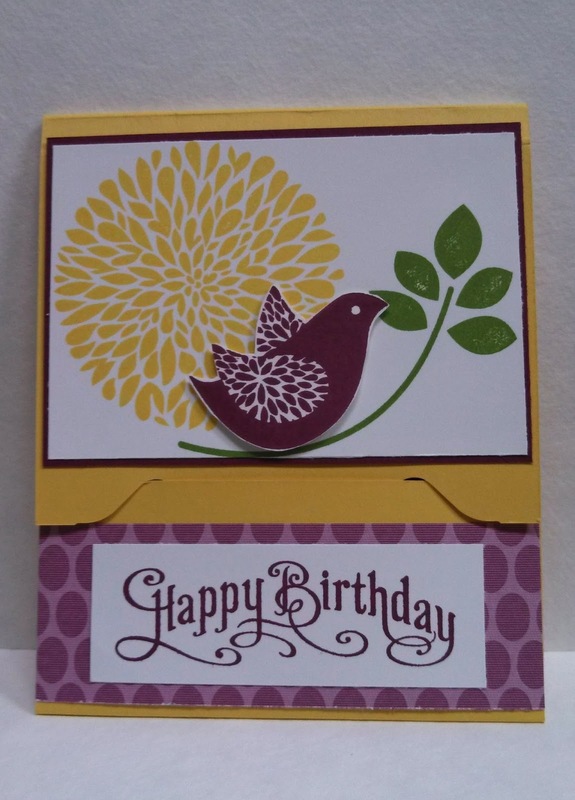 I love this DSP and since I will be hand delivering this card, I knew I could go bold with the flower. My card measures 4" squareand I punched the DSP with a non-SU! 2" scallop punch. Have the best Friday and thanks for stopping by! 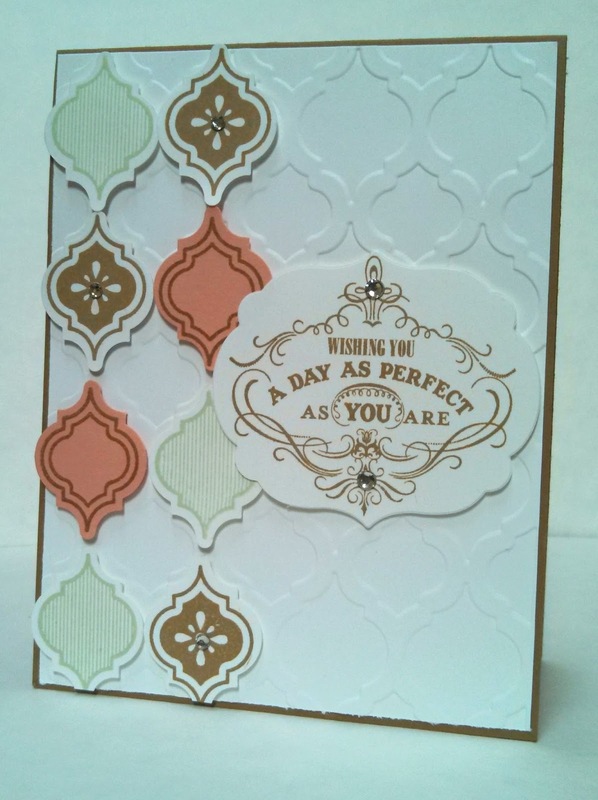 Paper: Crushed Curry, Coastal Cabana, Whisper White and Eastern Elegance DSP. Great Sketch from Pals Paper Arts this week! I am still adding to my Christmas card stash so everything from now until December will be Christmas themed except a few birthdays coming soon! Again because i had scraps of Modern Medley laying on my desk, I instantly knew my color combo. Real Red just seemed to fit with the Merry! Thank you for stopping by and have a great Thursday! Another blast from the past! 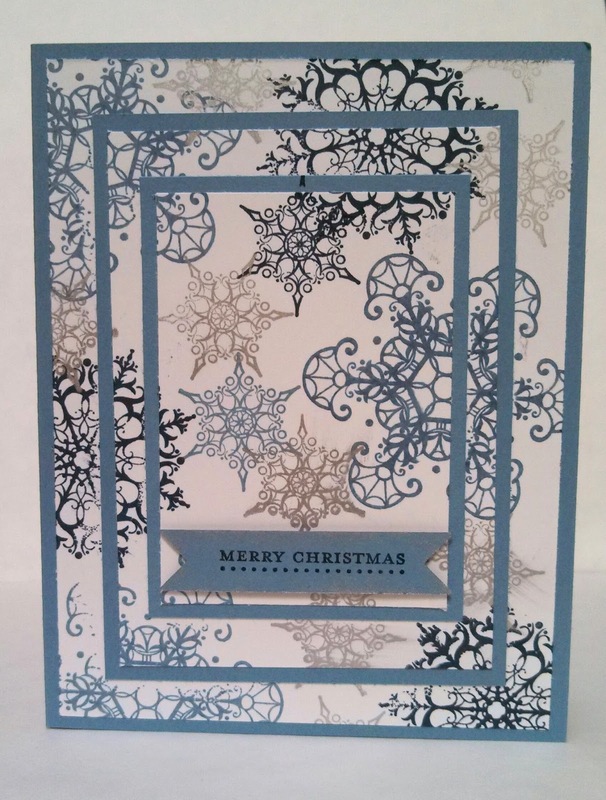 Designed this card for a Christmas card class last year. 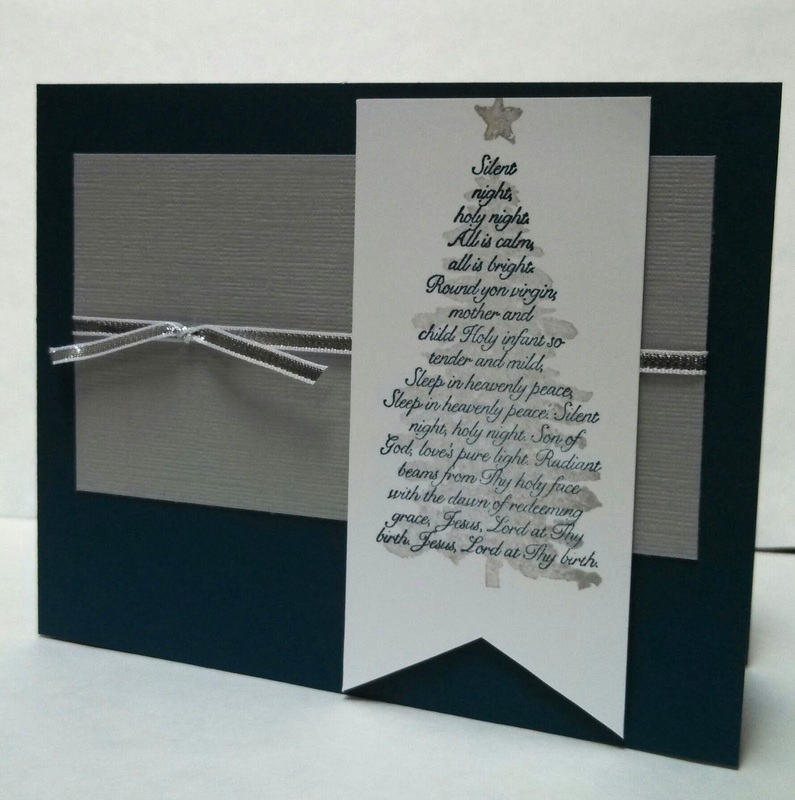 I like the tone on tone with the Marina Mist especially when embossed. 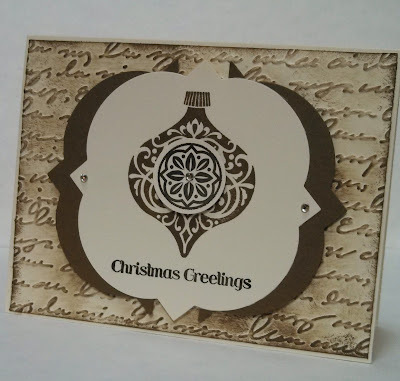 The sentiment is embossed in Early Espresso embossing powder. Both sets are current carry-overs. I have enjoyed the My Paper Pumpkin subscription so far. September was my 7th month receiving them. 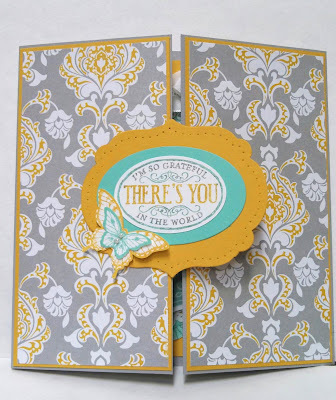 This card displays all the items from the kit except I used "love you" sentiment from Express Yourself instead of the "You did it!" that came in the kit. I plan to mail this one to my college girl soon! 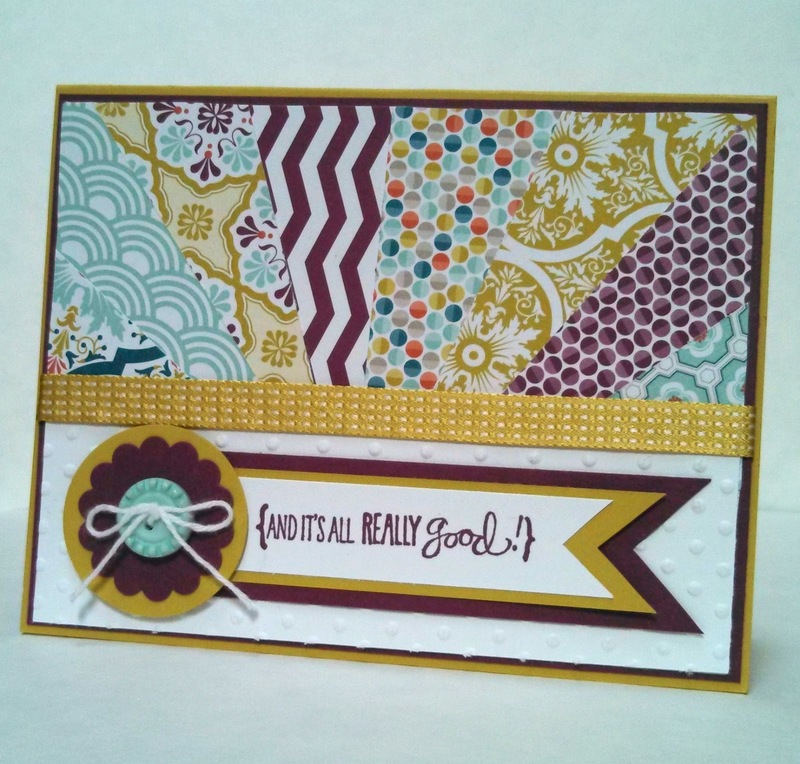 The colors here are Midnight Muse, Old Olive, Cajan Craze, Whisper White and Crumb Cake. 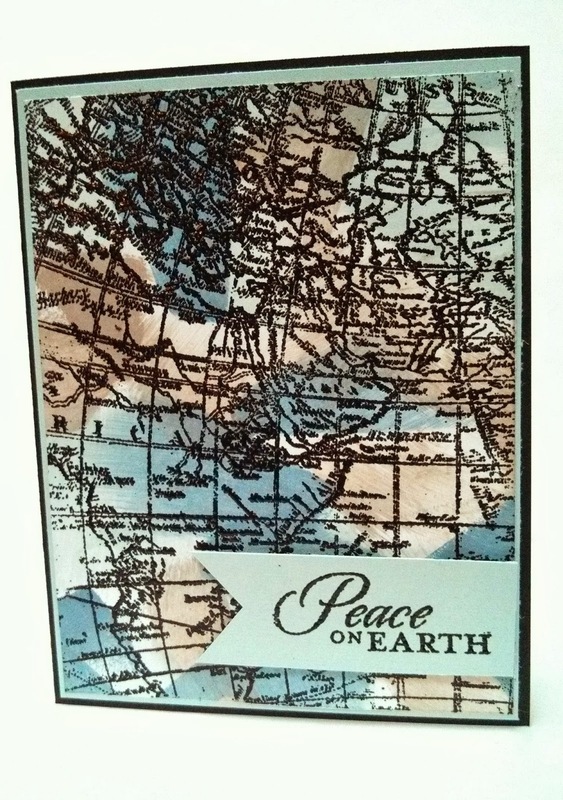 I received my World Map background stamp on Friday and got to play with it this weekend. 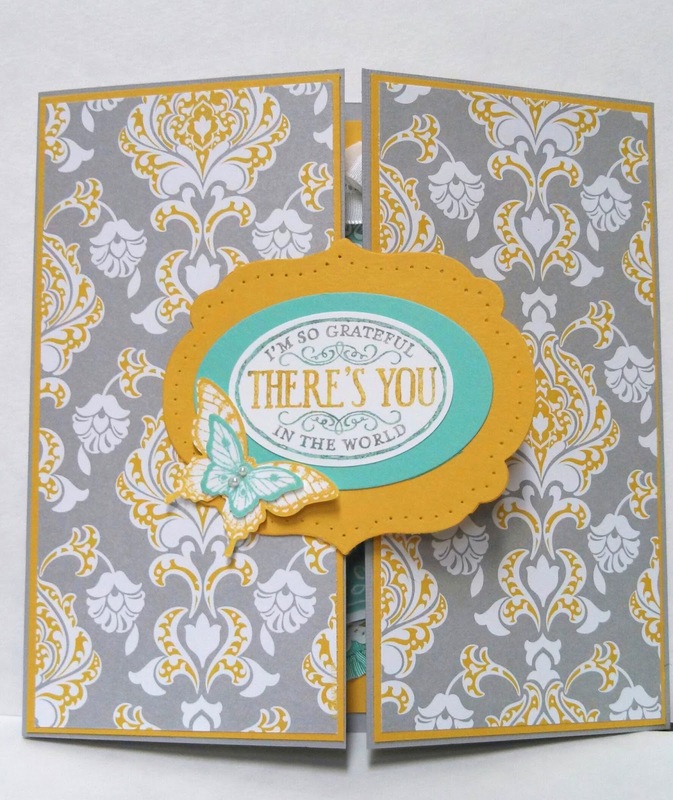 I knew I wanted to do a multi-color background and then emboss with black emboss powder. I choose a few blues and a crumb cake and really like how it turned out. I dragged the ink pads over the white cardstock and overlapped the colors. 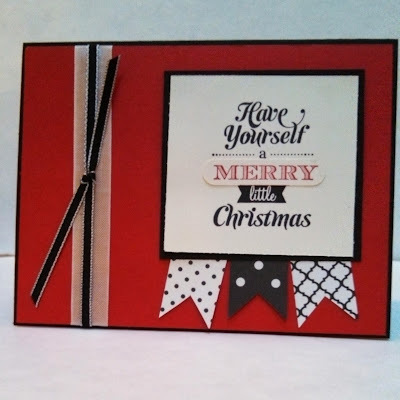 I add a noted Christmas sentiment to it and plan to send to my brother as his Christmas card this year! Going to try several colors over next week and see what color combo I like best with this great background stamp! 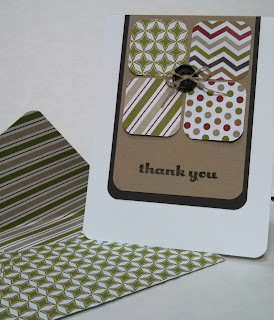 I learned some great tips for making and using the flip card from Mandi Swanson's video. I really like the Label Thinlit Card Dies but have not used a lot. I like this size and learned how to cut the DSP panel at same time as card. I also like the room inside to to write a message or stamp a sentiment. This card measures 4" x 4 1/4". 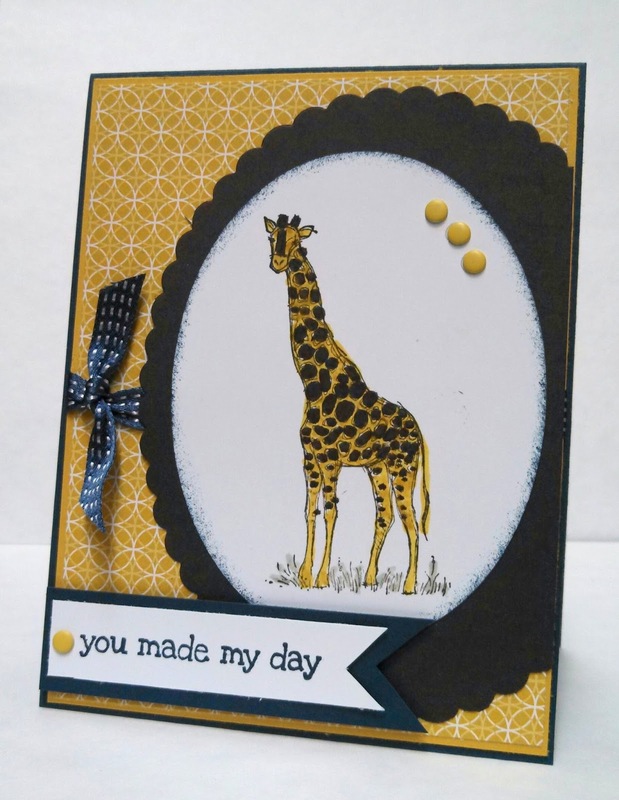 WE are going to make this card in stamp club this week as well. 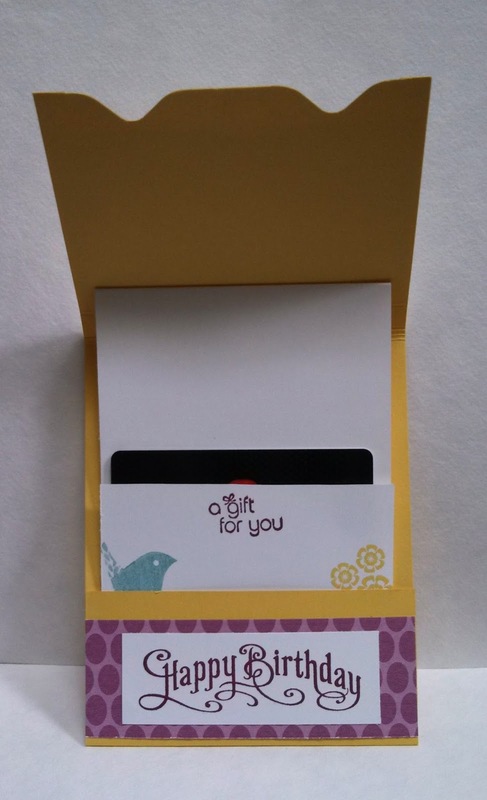 I viewed a video of this great gift card holder from Jackie Topa. 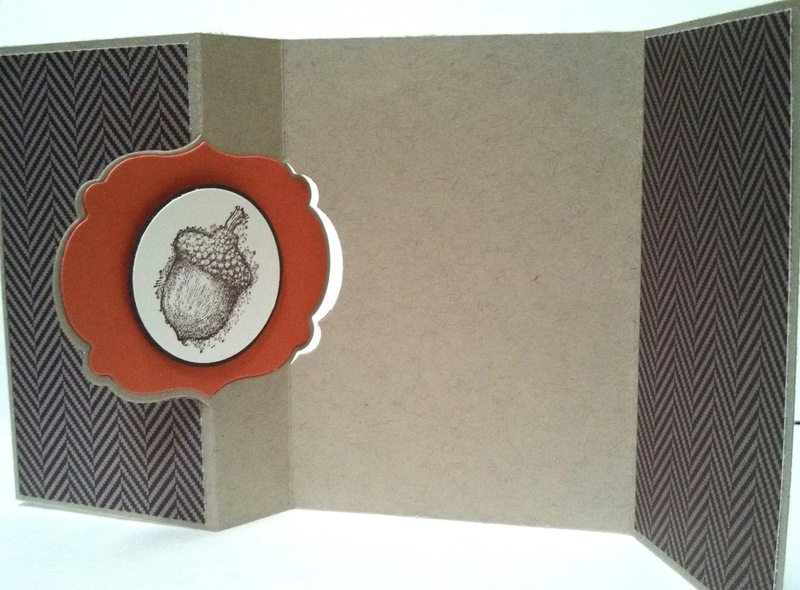 Not only does it use the new envelope punch board which is really versatile but the inside liner pulls up when you open it making it a little unique. 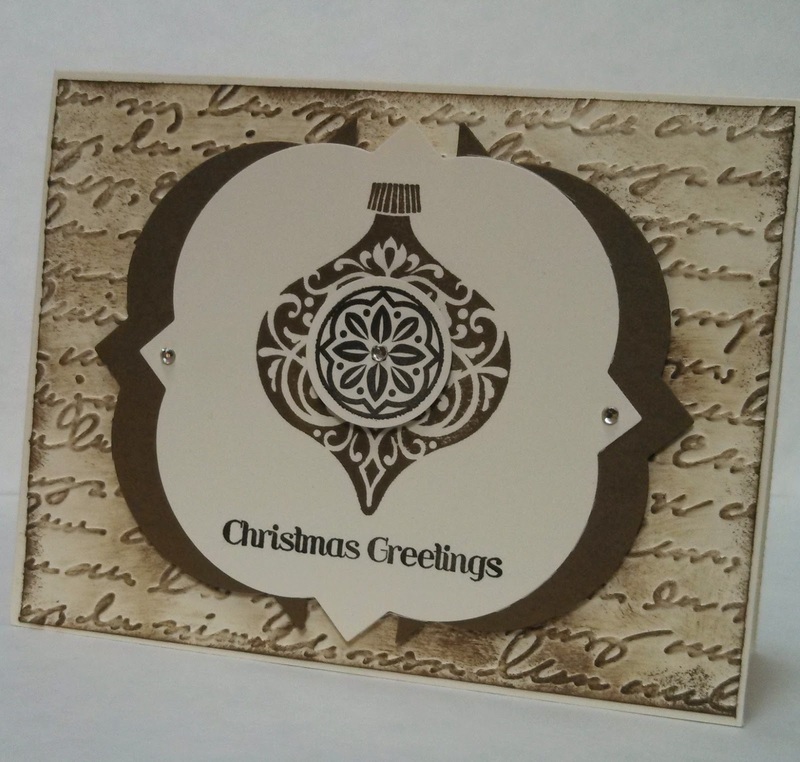 We are making this gift card holder at stamp club this next week. I made this one for my step-mother's birthday in October. I plan to enclose a Macy's gift card in there. This would be really easy to make for Christmas or other holidays coming up soon! It looks like a match book and measures 5 1/4" x 4 1/4" when closed. This card looks so rich in person. 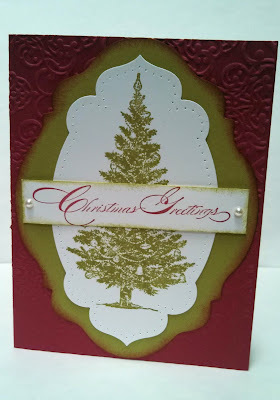 I used Smoky Slate ink for the background tree but I stamped off once before stamping on white banner. 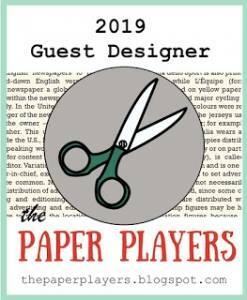 Another Paper Pals Art Sketch Challenge this week. I like these challenges when they come along since sketches are my weakness. 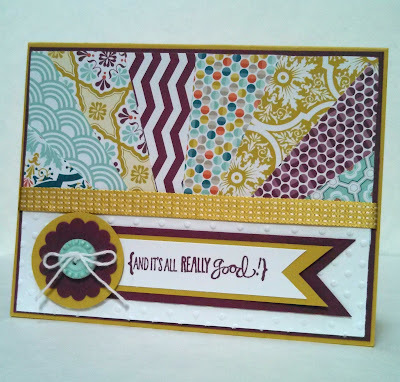 Scraps of DSP on my desk this week made this an easy color combo to use. 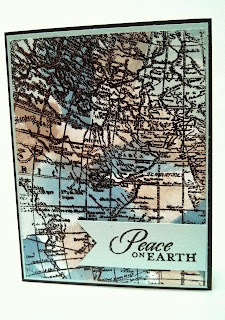 I really like this sentiment and I like it paired with deer stamp. 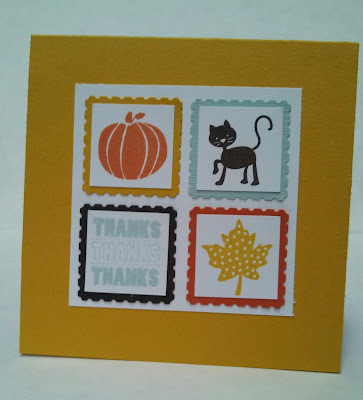 I made this quick thank you card measuring 4" squared this weekend for a customer who purchased a retired stamp set from me. SU! square punches make it so easy to stamp and then punch a cute card real fast. Easy color combo from one of our DSP collections, Sweater Weather. Enjoy your Wednesday and thanks for stopping by! Another card I designed earlier this summer for card class. 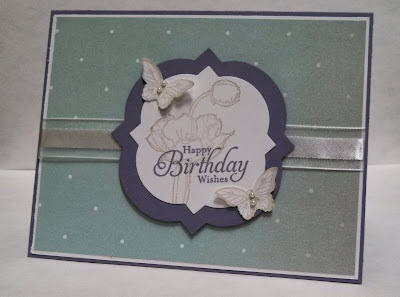 It was my first card I made with the new Mosaic trio-stamp set, punch and embossing folder. As I am seeing this card again, I realize I have not really used this set in several months. 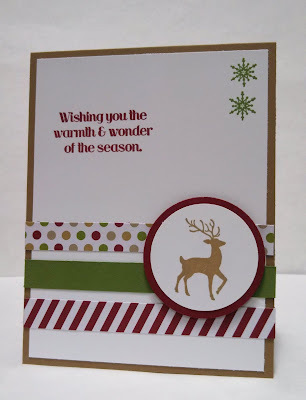 There have been so many new products and stamp sets to play with since new catalog and then right behind that was the Holiday catalog. I have been in fall and then Christmas card mode for a while now. I think I will have to play with these again soon! And its all really good! This was my first Sunburst or Starburst technique card earlier this summer. I wanted to make this card in stamp club and immediately thought of this bright and colorful DSP to use. I like the saying "its all really good". So glad SU! thought to include it in a stamp set! A throwback Sunday! I made this card last fall. It was my first attempt at the triple time technique which I love to do. I also love this set and the colors! I do feel grateful for all that I have esp. my stamping friends and the Pals which are my stamping family! Also very thankful I joined SU! over two years ago. They are such a wonderful company..I knew this as a customer but have been blown away by how they care for their demos and employees! I look forward to the sketches from Freshly Made Sketches each week. I am good with colors but not great when comes to layouts so I am happy when the sketch or layout is provided and I can just create from there. 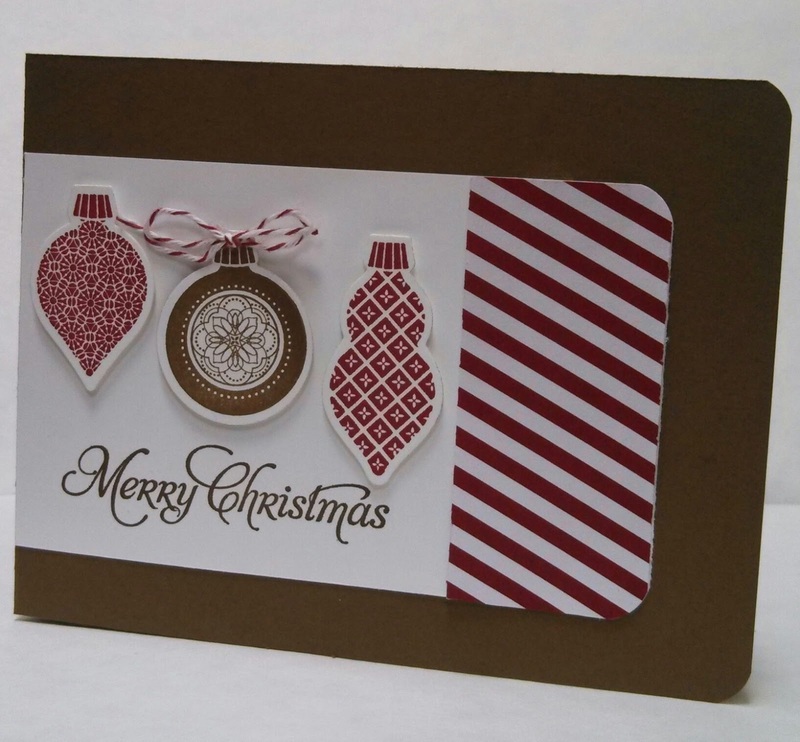 I first tried this card with two ornaments but it just did not look right. Then I remembered the words of my friend Brian King from Stamp With Brian.."Everything is better in threes!" So I did a redo and he is right..three was the thing I needed to balance the card! My last card from this week's Christmas card class. I cased the idea of the window framelits die from fellow Pal, Susan Itell at simplestampin.com. I love the way the sponged embossed card stock turned out and the Ornament Keepsakes set is always a classic set. Thanks for stopping and hope you have a great Friday! I enjoyed these colors esp. when I knew I had several DSP to chose from. But what was so cool was using a stamp I received this summer in a My Paper Pumpkin kit on the banner and the cup design to make my own DSP in the color I wanted. Hope you have a perfect Thursday! 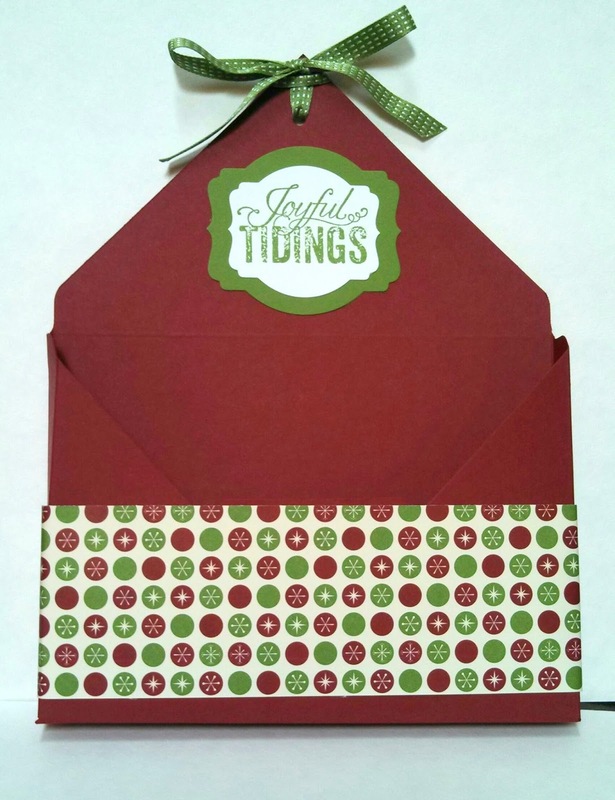 I made an envelope measuring 6" x 7" and then I scored it on three sides an inch in to make it a box to hold the 10 cards and envelopes they will take home from class. You can make 66 different sizes using the measurements on the punch board. It even has a corner rounded built in on the top. Great value at $19.95 (item # 133774). Another Christmas card from this week's Christmas card class. I was not sure I would like this poinsettia when I saw it in the new holiday catalog. But when I saw someone emboss it on color card stock, I knew I would really like it and I did love embossing it on the Cherry Cobbler. 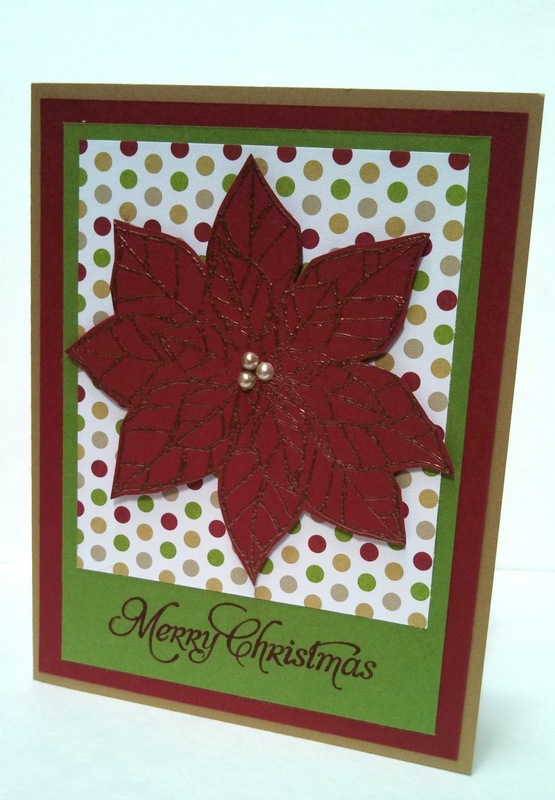 I was quick to snip out the poinsettia and I colored the pearls with the my Baked Brown Sugar marker. 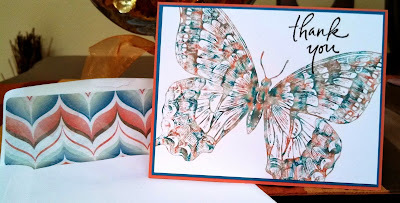 I received a card and matching envelope from my friend and Convention 2013 roomie, Pam Morris and it was so fun I thought I would share. The two things I really like about this card is first the layout which is one I do not usually think about doing. The other is that she used DSP that is for the holidays on a regular (non-holiday) card! Very clever! 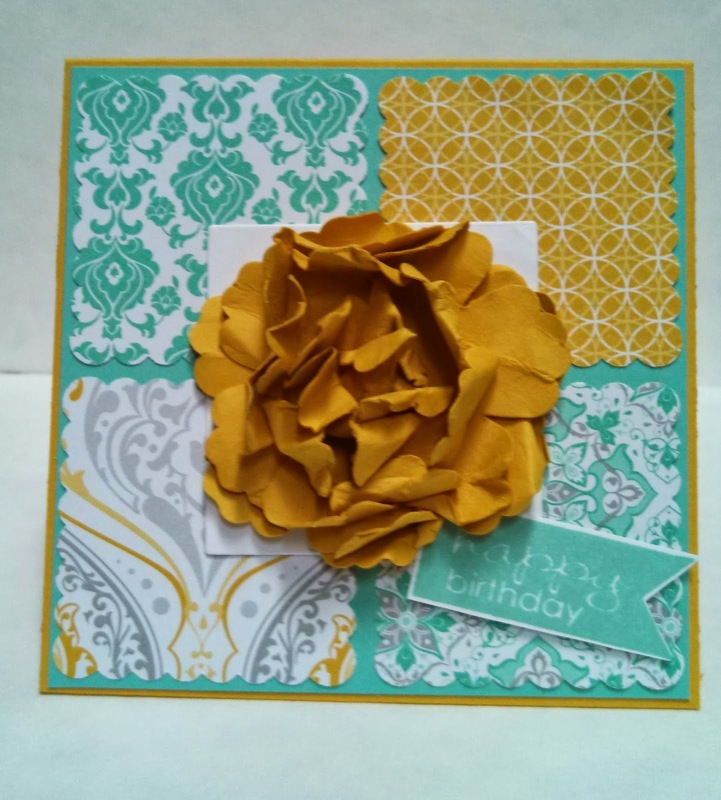 Loved the matching envelope, too! 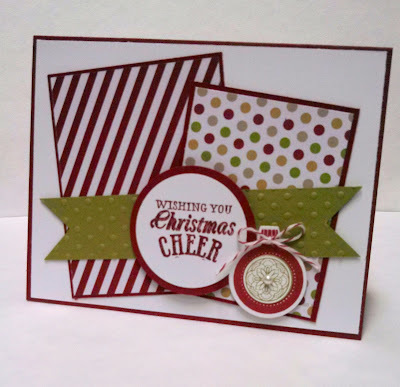 I am sharing another card from my Christmas card class scheduled for next week. I really liked how the tree looked in Old Olive but did not want to do the same old pairing with Cherry Cobbler (even though I really like those colors together and use them often). I chose to use Raspberry Ripple which really made the Olive pop and I will use this combo again. 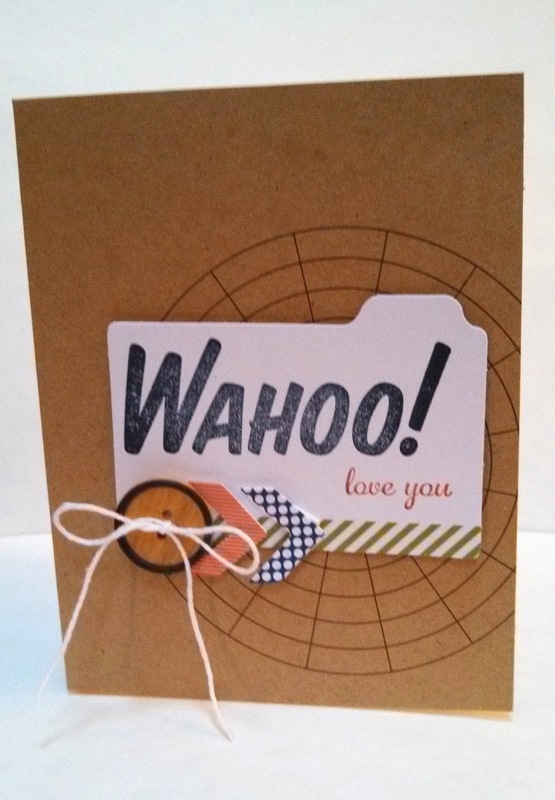 This is a special card for a special friend. My friend Jen and I have been stamping together for around 9 years and I would not trade the time together for anything! I really am truly grateful she is in this world or should I say my world. Very blessed to have such a good friend and someone to share my hobby with at the same time! 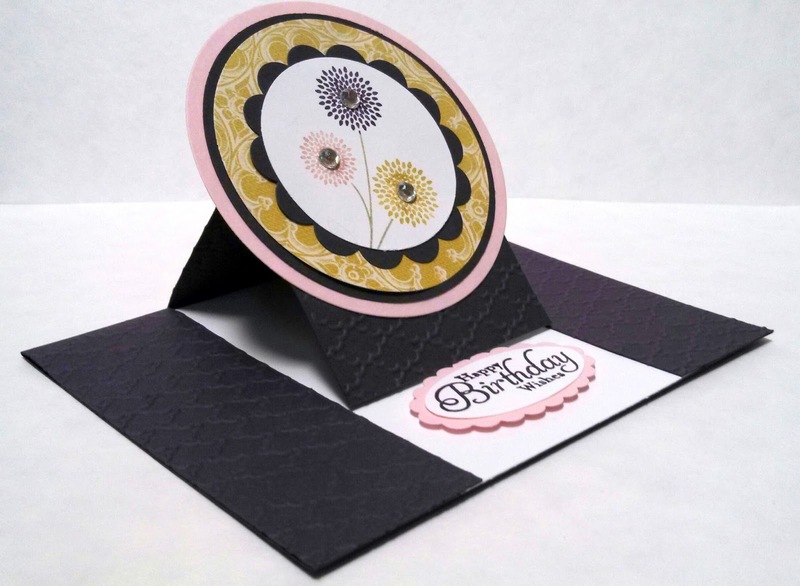 This gate fold card measures 6"x6" and was fun to make despite the many elements that went into making it. 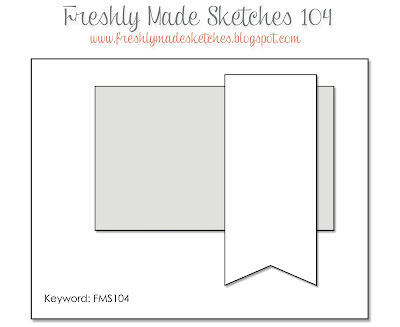 I really like this sketch challenge from Freshly Made Sketches this week. 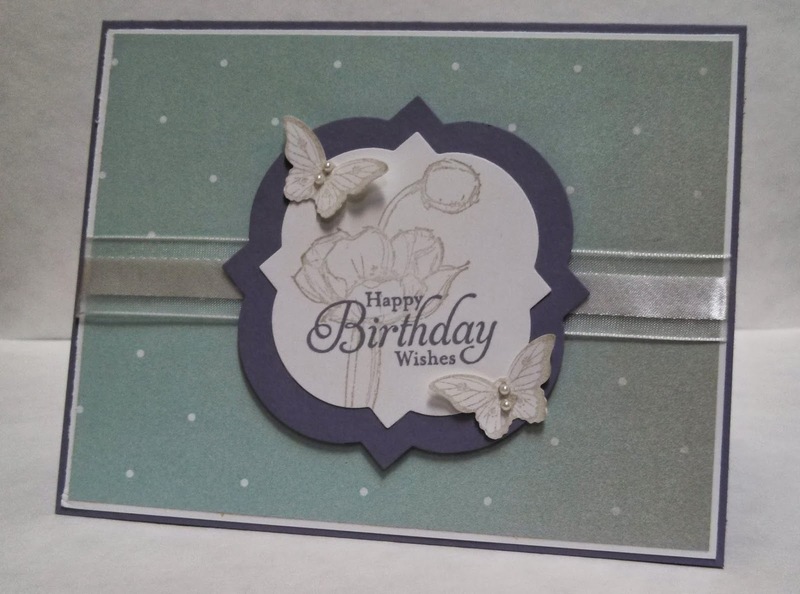 Very Easy and I needed to make more birthday cards so it fell into place quick. 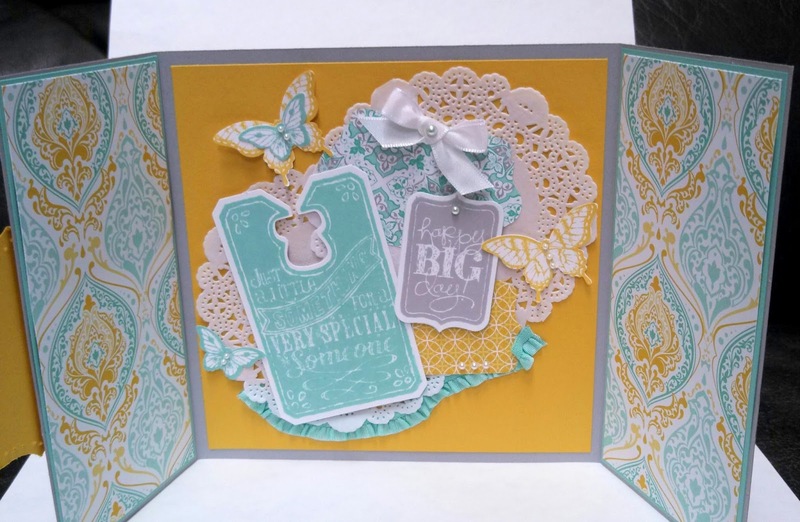 Playing the PPA is fun but this color challenge was well....a real challenge! I usually do not have two dark colors like Midnight Muse and Early Espresso paired together. Crushed Curry is not a very dark color but not so light either. I stared at my stamp sets for a while and then I thought about how the giraffe in Zoo Review could be colored with Crushed Curry and Espresso. I went on from there. I hope my giraffe friend here makes your day! I had plan to make a card with this layout. 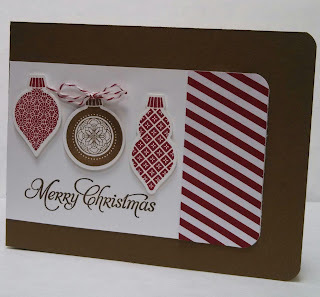 Then I saw a card on my upline's blog, Mary Fish at stampinpretty.com and wanted to case! I changed the sentiment and ornament used. Very thankful to have many talented people to whom I can find inspiration from. Enjoy your Wednesday and thank you for stopping by! 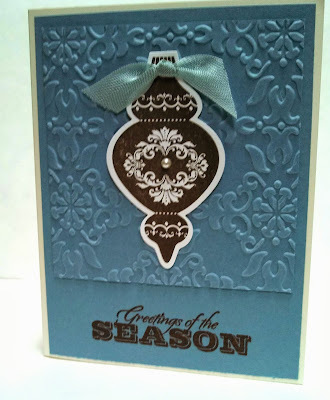 I am getting ready for my Christmas card classes next week and decided to design one card with the triple time stamping technique. Very easy to make but gives a wow effect! 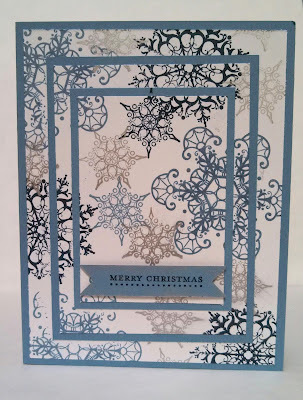 I love snowflakes and this set is so elegant! Enjoy! I saw these cute gift card holders on Becky's Blog, Inking Idaho, and wanted to make one for my daughter. 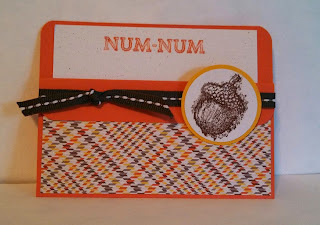 I choose the Num-Num sentiment from Oh, Goodie! 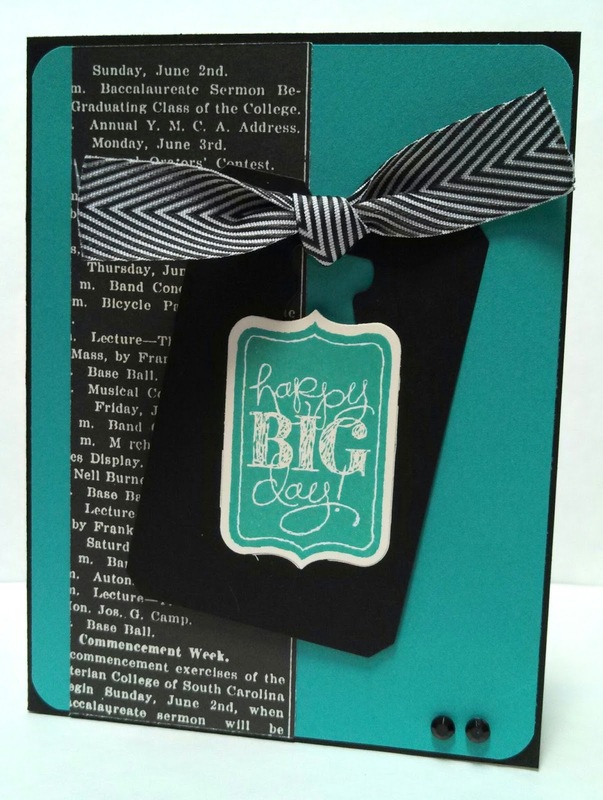 because I plan to insert a Starbuck's gift card in there and send it off to her at college! I have spent the holiday weekend cleaning my house and putting out my fall decor. So I naturally went for my Sweater Weather DSP as fall was on my mind. Holder measures 4" x 3". When I saw a fun Easel card on LeeAnn Greff's blog, Flowerbug Inkspot, I really wanted to make one! My favorite color is purple and it is weird but I usually do not make any cards in purple. 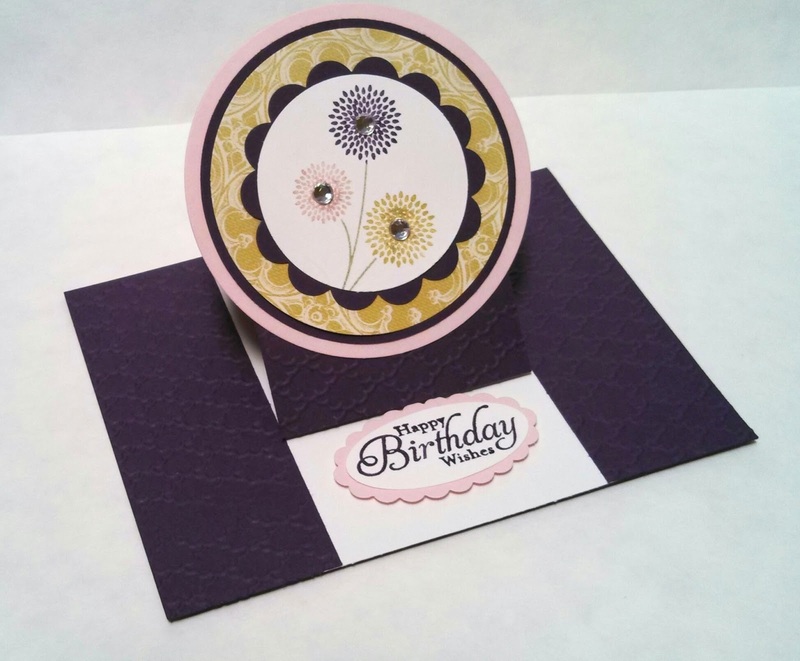 So I pulled out Elegant Eggplant card stock and then grabbed my color coach to tell me a combo. I think the hard part was deciding what stamp set to use. I like how it turned out! Have a wonderful Sunday and First day of September!